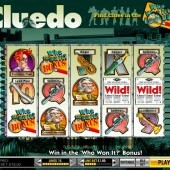 The Cluedo slot game has been created by online slot developer IGT and is based on Hasbro's popular board game. All the familiar characters feature, such as Colonel Mustard, Professor Plum and Mrs Peacock. The game itself is very simple, with little investigation needed, but several elements of the original game have been included in the slot version as you might expect. There are quite a few ways to win in the normal game, but it is the bonus round where most of the bigger wins can be found. To enter the bonus round you need to hit the 'Who Won It?' bonus symbol on reels 1, 2 and 3. You will then get to choose one of three murder suggestions. All three of them pay, but you need to decide which one you want. I prefer not to pick my wins in this way as I always seem to come up short. No Free Spins? There Will be Murder! There are no free spins in the Cluedo slot, which some slot fans will not be too happy about. However it does have a decent payout percentage (sometimes called RTP), which is around 96%. This is higher than other IGT slots like the timeless Cats slot and the atmospheric Siberian Storm slot, which did surprise me. 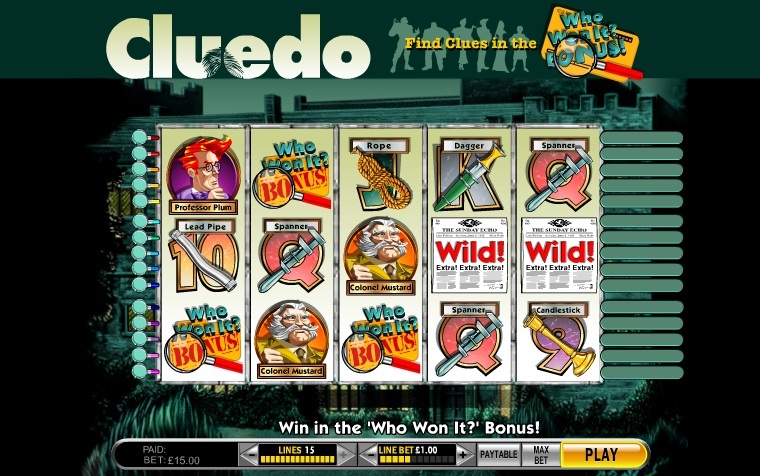 Cluedo slot is one of three IGT slots that have a progressive jackpot version, with the Egyptian-themed and iconic Cleopatra slot and the classic board game-inspired Monopoly slot being the other two. IGT's Mega Jackpots are linked throughout all online casinos that have them and this jackpot regularly grows to over £1 million.